If all you’ve got in your refrigerator is eggs, milk and butter, you’ve got yourself a meal. There isn’t a single time of day that scrambled eggs don’t taste good! Who knows, this simple meal may become one of YOUR signature dishes. When you buy eggs in the grocery store, check that there are no broken eggs in the carton. In the United States, by USDA requirement, eggs come already washed so you can use them straight away. Begin by cracking each egg individually into the small cup. Check the egg to see that it looks okay and that there are no shells. Then add the egg to the mixing bowl. 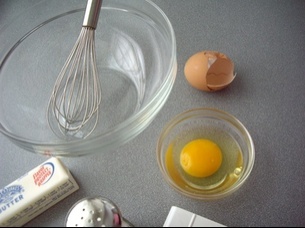 Beat this mixture with a fork, or a whisk, in a vigorous elliptical motion until the yolks and the whites are all a nice bright yellow and completely blended together. Put the beaten eggs to one side, and melt 2 teaspoons of butter over medium low heat in a non-stick pan. If you turn the burner up too high the eggs will cook faster, but you will end up with very watery, soggy tasting eggs. So be sure to keep the temperature at medium-low. 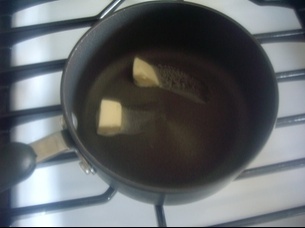 When the butter has melted, add the eggs to the pan. 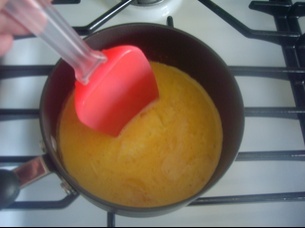 As the eggs begin to cook, GENTLY move them around with the spatula so that they cook evenly. GENTLY and slowly stir the eggs. Continue cooking the eggs until they are thickened but still soft. Some people like really soft scrambled eggs, other people like really dry scrambled eggs. Just keep gently stirring the eggs until they look like what you think the perfect consistency is. If you wish, you can add some extra ingredients while the eggs are cooking. For example, try tossing in some chopped ham, sprinkling in slowly as you stir the eggs. Or you might try adding some shredded cheese, or chopped green onion or chives. My favorite addition is chopped parsley. 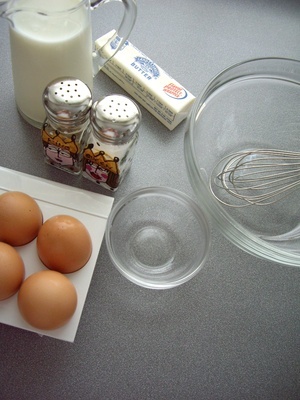 To find out even more about eggs, be sure to check out my post “How to: Eggs“. YIKES! When I was taking the photographs for this blog post I dropped my camera into the egg mixture! I scooped it out and wiped it off. The automatic lens sticks a little but my camera still works! Who knew? Interesting differences. I don’t use milk in my scrambled eggs – it does make for very rich eggs, but it’s how I like it :-). My favourite day-to-day addition is chopped chives, but of course, if you’re going for the ultimate scrambled eggs, then it has to be smoked salmon!! The other trick I learnt a while ago is to cook your eggs on as low a heat as you can (or have time for) – it really does seem to make much creamier eggs. The other thing to watch out for is that scrambled eggs will keep on cooking after you take them off the heat, so take them off a few seconds before you think they are ready and get them straight onto a plate. Please, please whatever you do, never leave scrambled eggs sitting in the pan – they will turn into rubber. You are so right Jon about cooking scrambled eggs on low heat. If the temperature is too high they get really watery. Yuck! 2 bowls? a silicone spatula? a whisk? I guess I can understand the problem… trying to get people to understand that they can cook, it isn’t that hard… but balancing out the best way to do something with the minimal way to do something…. maybe 1 plate unless you ate from the pan. Also, an ol’ fashion rubber spatula will not melt just by cooking with it… however, leave it in the pan sitting close to the bottom… then it WILL melt. Still like the site and posts… but consider that your target audience may not have the things that you show above to start with… and if they think they NEED it in order to cook… well, you might not get through to them. Graydon, thanks for jumping in and sharing another perspective. You are quite right in pointing out that a lot of people want a â€œminimalâ€ approach. For example, other participants in this blog have encouraged me to describe recipes that require the least amount of cleaning up, and Iâ€™m going to take that request (and yours) seriously. But there are other considerations. Iâ€™m trying to help people develop good habits that will help them in all their cooking. For example, youâ€™re also right that a â€œan olâ€™ fashion rubber spatulaâ€ will do the job, but in this case Iâ€™ll stand by my advice that even an impoverished beginner cook should buy and use a silicon one. It will turn out to have a lot of uses! Years ago Julia Child taught me an awful lot about cooking by going into great detail describing each step. Things like â€œcontinue stirring until that first waft of steam rises from the panâ€ seemed, at the time, like way too much information. But her technique worked for me! I am now trying to do the same. For people who have NEVER cooked, I would rather err on the side of providing a lot of detail, then leave them guessing. What constitutes low-medium heat? My stove goes from 1-10, but I don’t know what the terms correspond to. Is there a way to judge what it probably is? What if it was a gas oven, like my mom’s? Hi Watson, youâ€™re right – turning on a stove is not always that obvious. Some electric stoves give you text. Youâ€™ve just got a mysterious one. In general, the settings on a gas stovetop should be the same, but there is little standardization. For example, on mine, all it says is â€œHighâ€ and â€œLowâ€ and leaves it up to me to judge how much to turn the dial between those marks. Unfortunately, since the pressure in each gas stove is different, you just have to use experiment. Sorry, but thatâ€™s the way it is! By the way, most gas stoves have an automatic pilot. Turning them on usually involves turning until you first hear the snapping sound. Thatâ€™s the electric pilot turning on the stove. Once you see the flame, turn the dial so that the snapping stops. (You may get a whiff of gas, but thatâ€™s normal. It shouldnâ€™t be more then a whiff, though!) You then can turn it up or down. Donâ€™t leave it on the snapping setting. No respect needed, I was just jabbing at the “need” for all the different utensils. The instructions are great! I had been hoping that the previous post on how to crack an egg brought forth the trick to the one handed magic… but happy to see that the tried and true two hand method is alive and well. After finishing a wonderful scrambled egg breakfast with Winnie, we felt compelled to drop a note. Your tips are wonderful! We are especially pleased to know about the “new” 3-second rule with digital cameras! Your photos and advice are wonderful and we look forward to reviewing more blogs. Be well and thanks for the tips! Can anyone answer this? What makes eggs turn green after cooking them? Hi Earl, Iâ€™m assuming you mean the green ring you sometimes see around the yolk of hard boiled eggs. That means you have overcooked the eggs. It is fine to eat, but it just doesnâ€™t look very appetizing! My mother always put salt and milk or cream in her eggs, so I have also. However, I recently read or heard that adding salt to the uncooked eggs caused the whites to break down(?). No idea. I still add the salt. My signature scrambled egg dish is with dill. Oh yum! mmmm…. bacon fat, bits and pieces. I gotta go get some bacon. That chipotle seasoned stuff might work well. Hi Kathy, Thank you very much for help us with this. I have less than 2 years of married. I am from South America, so for me it’s very difficult cook here, because the food and the ingredients are differents. Today, I tried to cook some scrambles eggs for my husband and was terrible!..For that I started searching by internet some help. I found your web, and seriusly you help me a lot. My husband knows how cook, but he is too busy to teach me. I feel bad because his friends’ wifes know how cook. You show me step by step how do it. Most of the time I have very stupid questions, but it’s because all of this is new for me. Really I hate cook, but I want to learn and then love it!..I work and study, but I want to be a good wife and have a happy husband. I will start with these scramble eggs tomorrow morning. I’m sure he will enjoy it!! !..Thank you again, and don’t change your style..continue teaching step by step, you are helping us a lot! Welcome Molly! I am delighted you found startcooking.com. Good luck with the scrambled eggs. My niece, who has only just started to cook, found the Sante Fe Chili to be an easy dinner make. The Pasta Salad is a great summertime dinner as well! Cheers! Hi Kathy. All through growing up and eating my moms scrambled eggs, which are the best :). she said never to put salt on the egss till after they are done cooking, for two reasons. One, bc the salt toughens the eggs, and two, bc you may not really need it. Have you heard this before, about toughening the eggs? Hi Kim! Salt toughening scrambled eggs is a new one to me. I just checked “Joy of Cooking” and they add their salt in the beginning as well. Never the less, I think you should stick with your mom’s recipe-why mess with perfection! Drain the extra moisture off of a cup of store-bought salsa and toss that in during the cooking process. Good stuff. Also, and it may seem strange, but try putting a Tbsp of honey (or 2, depending on your sweet tooth) in the pan shortly after putting the eggs in. 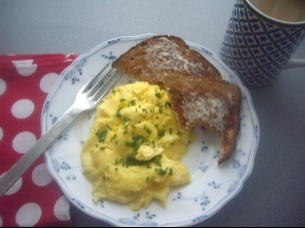 Honey scrambled eggs…my 5 yr old daughter loves ‘em. I should probably add that the honey should be added while the egg mixture is still in a liquid state, and keep the concoction moving constantly to prevent scalding (burning). Medium low heat is VERY important. Kyle-Salsa…most definately! Not too sure about the honey. That’s a new one to me! That’s a tough one Sue. It is really outside my experience. Does anyone else have any ideas on how to solve Sue’s green egg problem. Could it be because they use ‘fake’ eggs, like the powder that is mixed with water? Maybe from sitting out to long? Sue, I hope this helps! Thanks for looking that up! I know that sometimes when I hard boil eggs for too long the yolks have a greenish tint, but I couildn’t figure out the scrambled situation. I have a love/hate relationship with electric stoves. On the one hand, once you find a setting that works for a particular recipe, it’s very repeatable. On the other, I don’t think I’ve ever used two electric stoves that responded the same way. “3” on mine is going to be wildly different than the “3” on yours. The other thing I don’t like about them is their unavailability during a power outage. Obviously, you can’t cook, but without power your furnace doesn’t work, either, and your stove’s no help. In 48 years I’ve never experienced a gas outage, but power outages are as common as dirt. I hate cooking on an electric stove – particularly as I want instant control – when I want it ht I want it now and even more importantly for me, when I turn it down I want it to get cooler! We’re lucky here in the UK, because most homes are plumbed for natural gas and that really is my preference – I know just by looking at the flame what it’s doing, how can you do that on an electric hob? My cat used to sleep in the sink (but that was cause it was the coolest place in the house when it was hot out)!! Thanks KWG and Jon for helping everyone to realize that all cooktops are different and it takes time getting to know your own cooktop! I have a nuwave oven. I follow their recipe book but the eggs do not cook as well as they should. do you have any experience with nuwave ovens?Can you help me? I’d never heard of a “Nu-Wave Oven”, so I looked it up online and found out why. It’s one of those shopping channel things that are “Not available in any store!” – as if that’s a good thing. What they’re actually saying is no self-respecting retailer will stock them, because they’ll get them all back. Looking around some more, I find that even the online dealers aren’t stocking them. There are no reviews of them. No explanation of how they work beyond what nuwave says, which is painfully little. Just looking at the thing, I can’t see how you could cook eggs in it. If you did figure out a way, you’d end up with a substantial cleanup job afterwards. Sorry Elvira, I have never used a nuwave oven. Perhaps nuwave has a web site for “frequently asked questions” on how to use a nuwave. Good Luck! Kathy, although I’m not actually a beginning cook (more like a intermediate I guess), I stumbled on your blog not too long ago and I like it. It’s kind of fun to revisit the basics. My mother also always told me that salt added before the eggs were scrambled would toughen them and I also heard someone on a cooking show say that once, I think it might have been Alton Brown. At any rate, I think eggs salted after the cooking taste just as good as eggs salted before, so it likely doesn’t matter. Also as a tip, try adding some ground mustard powder to your scrambled eggs. It really brings out the flavor. Thanks Kate! I’ve never heard of adding ground mustard to scrambled eggs. I’ll have to give it a try! “How do scrambled eggs work? Can you salt them ahead of time? How can you keep them from becoming watery and weepy? I remember watching Graham Kerr and I think he was the one that talked about not adding salt during cooking, not because of how it affects the eggs, but that during cooking, the flavor is lost but the sodium stays. So you end up having to salt the eggs again to taste, and get extra sodium. I miss Graham Kerr’s cooking show(s). They were very entertaining and educational, much like Alton Brown’s show “Good Eats” is now. Personally, I don’t often salt foods while cooking because I compulsively add salt at serving time. I find salt to be more effectively used at that point, and it leaves how much to be added to the diner instead of me. I tend to oversalt things, and not everyone appreciates or can tolerate that. One of my very favorite chefs is Ina Garten of the Barefoot Contessa fame. Her recipes are a bit advanced but they are fool-proof. The one major problem is that she over salts everything! I have learned to cut back dramatically on the quantity of salt in all her recipes! “Ina Garten of Eden, baby! Don’tcha know that I love you? Ina Garten of Eden, baby! I’ve found that if you want to get that mouth-watering reaction and taste enhancement that salt gives, the best thing to use while cooking is the coarse-grained kosher salt. Unless you go nuts with it, you almost don’t know it’s there. Witness Campbell’s soup. That stuff has so much sodium in it you’d think it would make you squint after the first spoonful. Table salt, on the other hand, is much more obvious. I’m not sure why that is, but I have a theory that it’s the iodine they put in it. Either way, sodium chloride is sodium chloride, so if you have a problem with it, taste isn’t an issue. You need to use some other condiment such as one of the many varieties of vinegar. Inna -Gadda-Da-Vida?!? You’re dating yourself! Is there something better than milk—I’ve heard about half and half or light whipping cream—-Any suggestions!!!??? The recipes I’ve seen that use cream use very little – maybe a tablespoon to 3 eggs, or a teaspoon per egg. I’m not sure if that’s really what differentiates them as much as the gentler cooking method used. They’re done slowly, in a double boiler. Seems like a lotta trouble for scrambled eggs, but that’s just me. Of course, if you’re going to jazz ‘em up to impress somebody, that’s different. Cooking scrambled eggs on a low heat, slowly, and not stirring them too much is really the key to successful scrambled eggs. I agree with you KGW, a double boiler seems like overkill! For those of you ready to tackle making an omelet, you might want to check out my video on How to Make an Omelet! I knew about this recipe. I have done it several times because my frigidaire was empty and I didn’t have anything else but eggs, milk and butter. Indeed, it is great and easy to cook. Yes, scrambled eggs often come to the rescue and they always taste great. Thanks for writing in! My little tip on scrambled eggs is adding a generous spoon of Philly cream cheese! Makes the eggs so creamy!! The thing about making good scrambled eggs is to remember to keep the temperature very low or the eggs end up very watery. Everyone should know how to make at least one thing perfectly! Scrambled Eggs are so much better cooked this way! Its well worth the waiting to cook them slowly! When I make scrambled eggs though, I add a little bit of garlic (I only ever use granules because its easier, but I’m sure you could use freshly crushed) to the mixture, it really adds depth to the flavour. Its important to use sparingly though, because it can be a little too much, but its definitely worth trying! Garlic works well when you’re making eggy bread too. I have the Escoffier cook book, and was surprised to read in it that he considered scrambled eggs as the ultimate way to cook eggs. It is often the recipes with the most basic ingredients that can be the most challenging. Scrambled eggs, when cooked well are fantastic, but when done poorly, are a nightmare! Scrambled eggs have recently taken a very important place in our household. Our older daughter F (11) is a difficult, picky eater who will very rarely try anything new we put on the table. However she has a best friend she idolises who eats most things put in-front of her. F. recently returned from her friend having learnt how to make scrambled eggs in the microwave and she asked us if she could make them at home. Now when she wants her evening snack rather than crisps and sweets she is as likely to make herself scrambled eggs or she may have them for breakfast. Subsequently C her 8 year old sister has now started making them as well and we now have the delightful situation that both girls are beginning to cook for themselves and both love their microwaved scrambled eggs they make independently. Wow! Scrambled eggs in the microwave – who knew? I have only ever made scrambled eggs on the stove top. How do you do them in the microwave? Microwaved scrambled eggs are super easy but need to be timed carefully. I use a 2 cup pyrex measuring cup to cook them in. Rub the glass cup with a little softened butter. Crack two eggs and a tablespoon of milk into the cup. Whisk with a fork til blended. Microwave on high for 1 minute. It will puff up like a souffle with a liquidy middle. 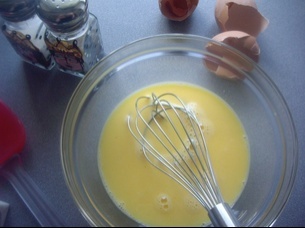 Remove and whisk again with a fork to break up the eggs and incorporate the liquid. Microwave again for 30 to 45 seconds. Voila! If they are still a little liquid (depending on the strength of your microwave) cook in increments of 5 seconds more until done. Very easy for teens and new cooks, and you can add cheese or herbs to your taste in the second cokking. Thanks Paula for the recipe! Graydon’s Method is close to deer-camp cooking. Number of eggs vary from 3 to 24, depending on how many mouths there are to feed. Also, it is 3:00 o’clock in the morning, so estimates of amounts of food, (or anything else), is always rounded up. 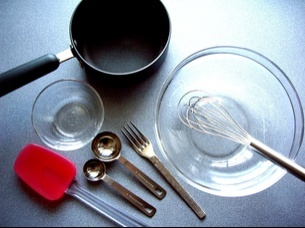 Dishes are usually done after they have been soaking for 5 or 6 hours, and usually consists of pans, forks, spoons and coffee cups. Left overs go in the pocket for a snack later. Eggs, biscuits, and ham, sausage, and/or bacon is also getting cooked. So, how about a good biscuit recipe? I scramble eggs without milk. It’s not necessary (I discovered this one morning when I was out of milk) and not using it eliminates a few calories and shaves off cooking time it takes for the milk to evaporate, and they’re never watery. I also use cooking spray on the pan; another way to cut fat and calories. I break two eggs into a bowl, add a dash of salt and pepper (one dash per egg), beat well, then pour into the heated pan. I like them firm, but not hard. The secret is keep them moving & not let them have contact with the pan for too long. MMM MMM.